While out on the range, cowboy Josh McCall finds himself the victim of vicious sabotage. Now he’s stuck in the wilderness with no one but city slicker Kate Carrington. 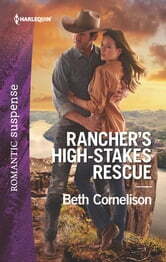 The rough-and-tumble rancher must use all his skills to survive, his willpower to protect Kate and his determination to resist their mutual attraction. Until Josh makes one fateful decision that could jeopardize their bliss…and their lives.